Empress Suiko (554-628) was the thirty-third ruler of Japan. She was the first empress regnant, and during her 35-year reign the 12 grades in court ranking—in the cap ranks—and the Seventeen-article Constitution were proclaimed. Suiko was the second daughter of Emperor Kimmei and was known as Toyo-mike Kashiki-ya-hime. In her childhood she was called princess Nukada-be. According to Nihongi, her appearance was beautiful and her conduct was marked by propriety. At the age of 18 she was appointed empress-consort of Emperor Bidatsu (reigned 572-585). When Emperor Sujun (reigned 588-593) was murdered by the great imperial chieftain Mumako no Sukune, ministers besought Nukada-be, the widow of Emperor Bidatsu, to ascend the throne. She refused, but the public functionaries urged her in memorials three times until she consented. Actually, it was Soga no Umako who made Nukada-be, his own niece, empress of Japan after the powerful Soga chieftain caused Emperor Sujun to be assassinated. This was a sharp departure from precedent, as there had been no reigning empress since legendary matriarchal times. It is clear from the genealogical table of the imperial clan at this time that the imperial family had numerous male members who could be made to ascend the throne. Soga no Umako, however, was following the policy of his father, Iname, by putting on the throne the child of a Soga mother. Once Empress Suiko was on the throne, Umako nominated as heir apparent and regent not one of Suiko's seven sons but the second son of Yomei, the Prince Umayado (Shotoku Taishi). Nihongi makes it clear that the prince regent had "general control of the government, and was entrusted with all the details of administration." widely under the official support of the imperial court. By 596, the construction of the Hokoji was completed, and the two Korean priests took up their residence in that temple. In the winter of 602, another Korean priest, Kwal-leuk, arrived from Paekche with books on calendar making, astronomy, and geography. Almost immediately, a number of students were selected to study these new sciences. The 12 grades of cap ranks were first instituted in 603. The system was modeled after the Chinese one of distinguishing ranks of court officials by the form and materials of the official caps. Nihongi recorded that the prince regent also prepared in person the first written "constitution" of Japan, which was promulgated in 604. It is evident, however, that the document was rather of the nature of moral maxims and some political principles, which the prince regent was said to have regarded as essential conditions for political reforms in Japan. The Seventeen-article Constitution is an important document and one of considerable historical interest, as it reveals the conditions of Japanese government and politics at the time. According to some historians of Japan, including George Sansom, the document is not accepted today as Shotoku Taishi's own work. Sansom believes that the document was probably written as a tribute to his memory a generation or more after his death, when some of the reforms which he desired had at last been introduced. This was a not unnatural act of piety, since the prince regent did beyond doubt play a leading part in the importation of new ideas and practices from China and Korea. Many aspects of Japan at about the time of Empress Suiko, who outlived the prince regent, were revealed in the constitution. According to Nihongi, the first article declared that "harmony is to be valued, and an avoidance of wanton opposition to be honored." The nation was told to sincerely revere the three treasures of Buddhism as "the supreme objects of worship" in the second article. The third article provided, "When you receive the imperial commands, fail not scrupulously to obey them." The functionaries of the state should make "decorous behavior" (li in Chinese) their leading principle, according to the next article. "Ceasing from gluttony and abandoning covetous desires, " state officials were enjoined by the document to "deal impartially with the suits which are submitted to you, " and also to "chastise that which is evil and encourage that which is good." The seventh and eighth clauses declared that the "spheres of duty" should not be confused and the ministers and functionaries should attend the court early in the morning and retire late. The constitution then held that "good faith is the foundation of right, " and the tenth article stated, "Let us cease from wrath, and refrain from angry looks." The eleventh article commanded the state officials to "give clear appreciation to merit and demerit, and deal out to each its sure reward or punishment." Indicating that local authorities were at this time giving way to the central government, the twelfth article provided that provincial authorities should not levy exactions on the people. "Let all persons entrusted with office attend equally to their functions" was the thirteenth command, and the fourteenth prescribed that the ministers and functionaries should not be envious of one another. To turn away from that which is private, and to set the faces toward that which is public— this was declared to be the right path of a minister. Again revealing what must have been a widespread practice at the time, the sixteenth article directed, "Let the people be employed [in forced labor] at seasonable times." The last clause stipulated that decisions on important matters should not be made by one person alone. 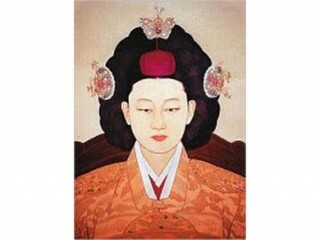 During the reign of Empress Suiko, expeditionary troops were sent to the kingdom of Silla on the Korean peninsula. The most notable development, however, was that Buddhism thrived in Suiko's reign, and the Shitennoji, the Horyuji, and many other temples were built at the order of the Empress. View the full website biography of Empress Suiko.